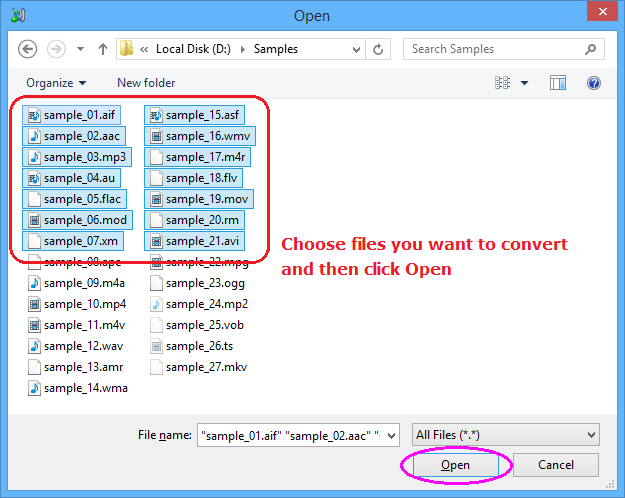 Click "Add Files" button to choose files that you need to convert, and then add them to conversion list. The software supports 264, 265, 302, 3G2, 3GP, 4XM, 669, 722, A64, AA3, AAC, ABC, AC3, ACT, ADF, ADP, ADTS, ADX, AEA, AFC, AIF, AIFC, AIFF, AL, ALAW, ALW, AMF, AMR, AMS, ANM, ANS, APC, APE, APL, ART, ASC, ASF, AST, AU, AVC, AVI, AVM2, AVR, AVS, BFI, BINK, BIT, BMV, BOA, C93, CAF, CAVS, CDATA, CDXL, CIN, CINE, DAUD, DBM, DFA, DIF, DIRAC, DIZ, DMF, DNXHD, DRC, DSF, DSM, DTK, DTS, DTSHD, DV, DVD, DXA, EA, EAC3, F32BE, F32LE, F4V, F64BE, F64LE, FAP, FAR, FLAC, FLIC, FLM, FLV, FRM, G722, G723_1, G729, GME, GSM, GXF, H261, H263, H264, H265, H26L, HEVC, HNM, ICE, IDCIN, IFF, IRCAM, ISS, IT, ITGZ, ITR, ITZ, IV8, IVF, LATM, LBC, LMLM4, LOAS, LVF, LXF, M1V, M2A, M2T, M2TS, M2V, M4A, M4V, MAC, MDGZ, MDL, MDR, MDZ, MED, MGSTS, MID, MJ2, MJPEG, MJPG, MKA, MKV, MLP, MLV, MM, MMF, MOD, MOV, MP2, MP3, MP4, MPA, MPC, MPC8, MPEG, MPEGTS, MPG, MPO, MT2, MTM, MTS, MTV, MV, MVE, MVI, MXF, MXG, NFO, NIST, NULL, NUT, NUV, OGA, OGG, OGV, OKT, OMA, OMG, OPUS, PAF, PMP, PSM, PSP, PTM, PVA, PVF, QCP, R3D, RA, RCO, RL2, RM, ROQ, RPL, RSD, RSO, S16BE, S16LE, S24BE, S24LE, S32BE, S32LE, S3GZ, S3M, S3R, S3Z, S8, SB, SDP, SDR2, SEQ, SF, SHN, SLN, SMK, SMUSH, SOL, SON, SOX, SPH, SPX, STM, STR, SW, SWF, TAK, TCO, TEE, THD, THP, TMV, TS, TTA, TXD, TXT, U16BE, U16LE, U24BE, U24LE, U32BE, U32LE, U8, UB, UL, ULAW, ULT, ULW, UMX, UW, VB, VC1, VID, VIV, VMD, VOB, VOC, VQE, VQF, VQL, VT, W64, WAV, WC3MOVIE, WEBM, WMA, WMV, WSAUD, WSVQA, WTV, WV, XA, XL, XM, XMGZ, XMR, XMV, XMZ, XWMA, and YOP. Click on "Convert" to convert all files into target format. 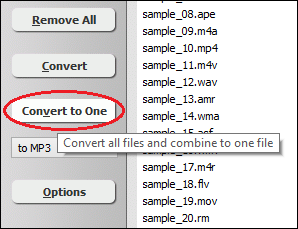 If you want to convert all files and combine to a single one file, please click "Convert to One". 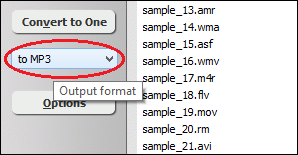 Output Folder: Click on the button to locate to output folder. Threads: File number the program converts files at the same time. It's very useful to multi-core CPU. We recommend the number equals to number of CPU cores. Priority: Conversion priority of CPU. You can set to a low priority so you could do other things at the same time without slowing system down. 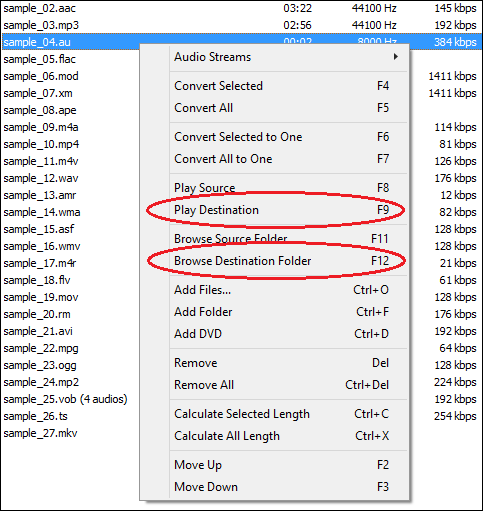 When conversion completes, you can right-click converted item and choose "Play Destination" to play the destination file; or choose "Browse Destination Folder" to open Windows Explorer to locate to the destination file. 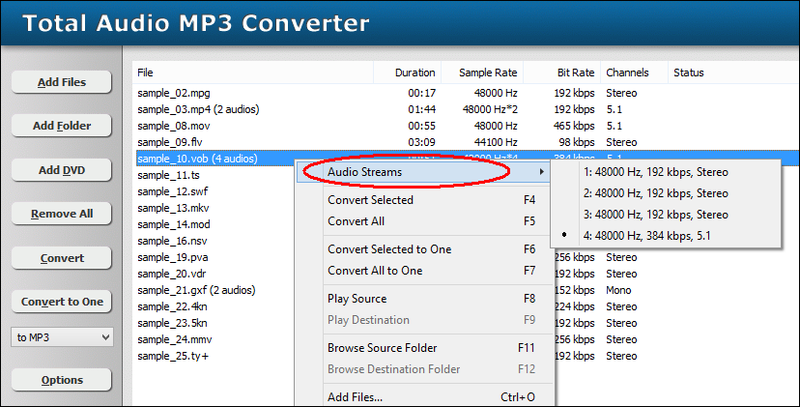 With Total Audio MP3 Converter, you could convert part of original file or trim audio. To do that, please click "Options" on the program, and then switch to tab "General", and then check "Convert from" and "Only convert" or "Ignore the last" and then set duration before converting file. Convert from: Set conversion start point. Only convert: Set fixed conversion duration. The option and "Ignore the last" below can't be checked at the same time. You can check either one of them. Ignore the last: Let the program not convert the last X duration. Conversion duration = file duration - duration of this option. 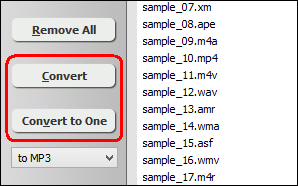 If you want to convert all files in list and combine to a signle one file, you could click "Convert to One" at step 3 above. The program will normalize all files and then combine to one file. You can disable normalization if all files are encoded with exact same parameters at Options -> General. Some video files such as DVD, Blu-ray disc, MKV, MP4 contains multiple audio streams for different languages. 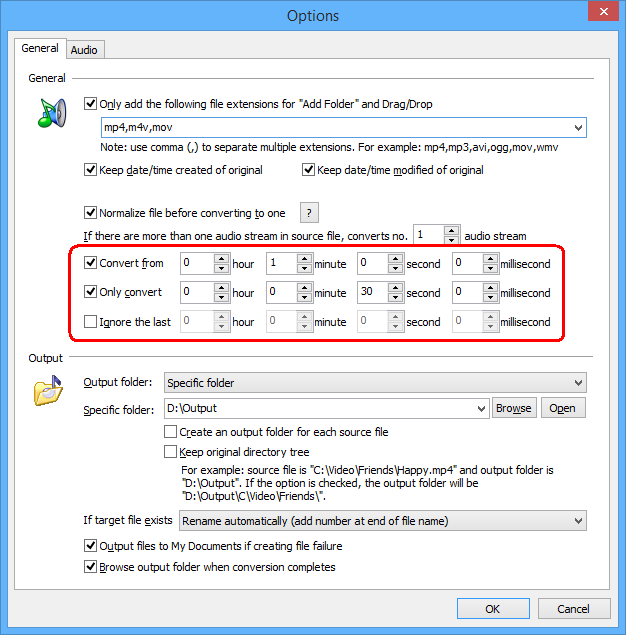 To extract an audio stream, you could right-click on the file item and choose "Audio Streams" and then choose the one you want, and then start converting. In some cases, you may need to convert a file to more than one formats at one time. 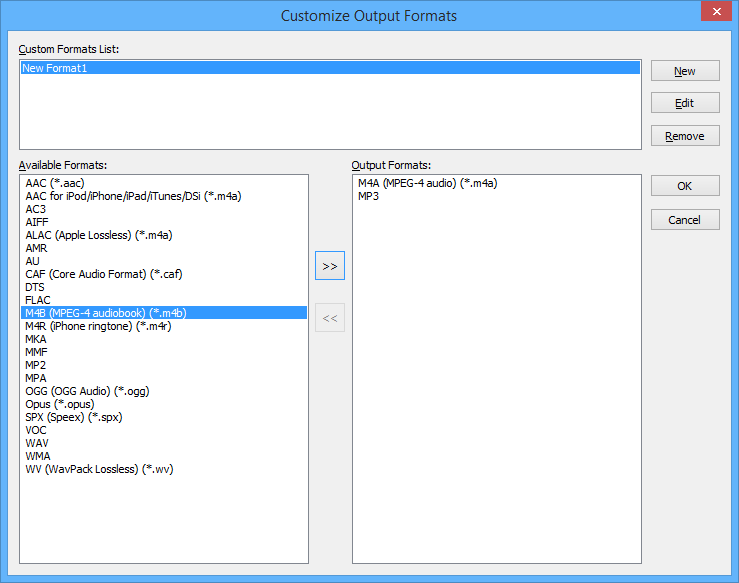 The "Customize Output Format" is designed for the situation. Click "New" to create a new output format, and then select output formats from left panel and then click ">>" to add to right panel. The formats in right panel are output formats. Click "OK" to save the new formats. 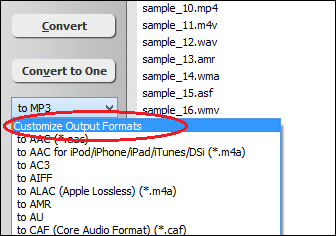 The new format appears in output format combo-box. You can choose the format like normal format. In screen shots above, I created format "New Format1" that includes M4A and MP3. 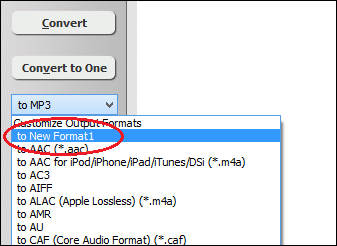 If converting a file to the "New Format1", the converter will convert the file to M4A and MP3 at one time.